Any insomniac can tell you about the deep questions that plague them at 3AM when they’re desperately trying to get some much-needed sleep. What happens after death? Who decided that salt and pepper should be the two seasonings that absolutely everyone has on their tables at all times? Seriously, what is the deal with the platypus? I wonder how long it took to build the Millennium Falcon? I can’t provide conclusive answers to any of those questions, but I can say with some confidence that the answer to the last question is “a really freaking long time.” After all, it took a team of engineers and designers from 3D printing marketplace Gambody several months to design, print and assemble a 3D printed replica of the iconic Star Wars ship at a 1:34 scale. The time and effort were worth it, though; Gambody’s mini Millennium Falcon is incredibly detailed, accurate and, frankly, quite beautiful to look at. It’s obvious that its designers are an experienced and skilled crew. Gambody, which launched in 2014, is an online marketplace dedicated solely to the designing, buying and selling of 3D printed game models. The intersection of 3D printing and gaming is something we’ve talked about many times, and Gambody and its community of enthusiasts really exemplify this particular niche. It operates much like any other 3D printing platform, in that users can create accounts to upload and sell their own designs, but the site also has a team of in-house designers who design and sell a significant amount of work, including the just-released mini-Falcon. Like Gambody’s other products, the baby Falcon is sold in STL format; this particular model consists of over 200 parts. Currently the site is selling the Standard Assembly Kit, which costs $74.99 and consists of only (!) 176 parts making up the top and bottom hulls. An additional kit will be released later this year with files for the interior layout of the ship. The design team spent 800 hours modeling the ship, which is 717mm wide, 1000mm deep and 244.46mm wide and features minute details such as secret compartments, wiring and ventilation systems, and functional landing gear. If you decide to print your own, be warned – it’s no small task. According to Efimov, you’ll need at least 3 standard rolls of filament and “2-3 months of intensive printing, depending on the type and quality of your 3D printer.” Assembly will likely take another month, but that’s the fun part. The team recommends printing your model at a 0.01mm layer height for optimum results. Gambody designed its ship based on Star Wars Wiki sketches, and the team is still working on additional improvements and modifications, including changes to the boarding ramp and mechanical chassis. Hopefully, the model won’t require as much maintenance as the original Millennium Falcon, although that would add a certain air of authenticity. If you’re ready to start printing your own, there’s plenty to work with, and Gambody has also provided an instructional video (see below) for when you’re finally ready for assembly. 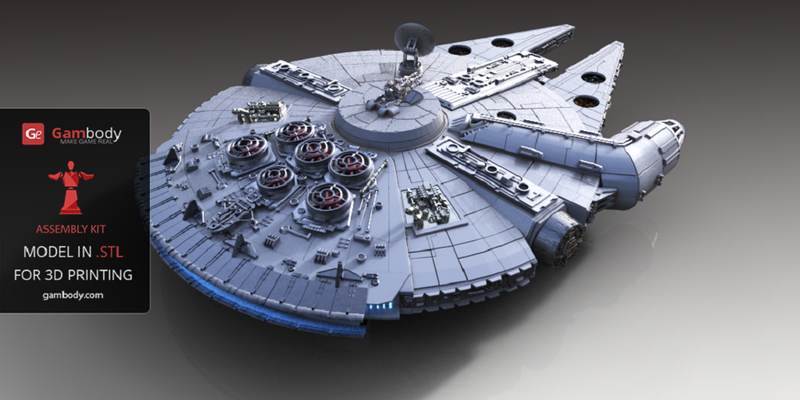 Discuss in the 3D Printed Millenium Falcon forum over at 3DPB.com.